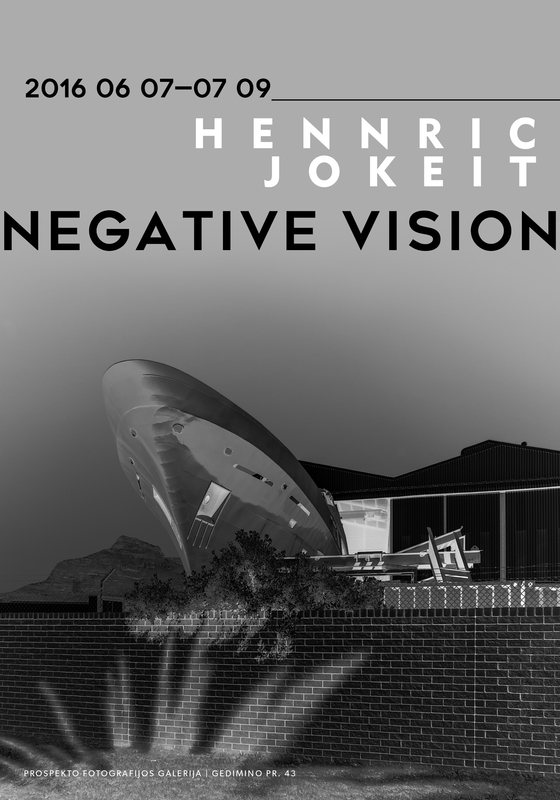 The exhibition “Negative Vision” by German photographer Hennric Jokeit opened on the 7th of June in the “Prospekto” photography gallery. The photographer presents photographs created by converting digital photography into negative image. For Jokeit, the relationship between the image and the beholder and the moment of looking itself are more important than technological particularities of photography. After viewing the exhibition I agree with the critic Enno Kaufhold’s opinion that the essence of Jokeit’s works lies in the additional meanings created by negative vision, while rethinking the relationship with the positive. The negative, which has usually been the precondition for the appearance of the positive, reveals an image that disturbs the beholder in Jokeit’s works. Everything is not as it should be – houses, interiors, natural and urban landscapes are engraved by the darkness shining out from the corners, nooks, and roots of the trees. The snow on the hills is black and the branches of the trees appear as ghosts of the dead in Jokeit’s photographs. Perceptual processes become confused and we begin to solve the puzzle while looking at the negative – what does the positive look like? Perhaps we could call it the exercise of vision and perception? Looking and trying to convert the image makes the process of looking conscious, although the perception of the flow of images is usually unconscious. I think Jokeit questions not only the way of seeing, but also the perception of reality by converting the visible image. Photography, and contemporary photography in particular, raises questions about visual perception. For Jokeit and other conceptual authors it is more interesting to explore photography itself as a media, which forms the perception of the world via an image. In short, one returns to the question “objective or subjective” over and over again in photography. Information received through vision remains in our subconscious as images. The photographer is a neuropsychologist and being well acquainted with neural processes analyzes cognitive principles of vision and its relationship with the conscious and subconscious through photography. It’s no surprise that the relationship between photography and vision is inherent – a photo camera operates as an eye. The anatomical structure of the eye and the physiology of vision have become the basis for the technology of photography. Only for us the result of vision remains a subjective photograph – a memory. The attention is focused only where the enduring value of information is. Although it is a simple trick, Jokeit’s negatives encourage one to perceive the relationship between the image and oneself. We become the creators of meaning while scrutinizing the visual text of the negative. The image of the negative suggests the opposition between the negative and the positive, which is based on the semantic relation “subjective-objective”. Jokeit looks beyond the global flow of digital images. Today, digital images are omnipresent, serving as a window to any situation of contemporary reality. They are impossible to avoid unless we cover our eyes, but even with our eyes closed we remain in-between this and virtual reality. Common everyday spaces – room interiors, a street, a fence or an empty abandoned corridor – help Jokeit to locate himself beyond the digital image. It’s very easy to place oneself in these insignificant household situations, i.e. to feel your presence in it. Thus, while the flow of images from screens is the source of information, i.e. of alleged objectiveness, Jokeit tries to oppose this tradition of visual hyper-objectiveness by means of his negatives. His photographs help to feel what it means to go beyond objective images, which give useful information, and to settle in the backstage of the reversed negative. It is the consciously perceived relationship between the beholder and the image, related to the efforts to tear oneself off the digital surface, to crawl behind it, while denying the principles of light and darkness, thus denying objectiveness per se. After reversing the contrast, the attention becomes focused on the hidden areas lying in the darkness of the positive image and exposes the depicted objects and the beholder to the other existence. Captured everyday moments are the evidence of subjective reality or the trace, following which the beholder can envisage the forthcoming image in his mind. Jokeit directs our attention to the negative culture of the postmodern world by means of converting the positive image into the negative. Visual culture gives a consumer the opportunity to experience fictive lives, to feel alive via cinema, television, and mass media while in reality you are lying on your sofa staring at a screen day by day. It is life that denies the very concept of life because you never experience what you wish to, because it simply doesn’t exist. The deception itself probably begins with the impossibility of an image. Everything begins with one frame in Jokeit’s exhibition and continues frame by frame until we conduct insignificant every-days into harmonious sound by closing and opening our eyes. Harmonious, imaginary experience intertwined with the reality of life and impressing itself into consciousness in the form of a drawing made by light. The final image is not possible, the author suggests, as objectiveness is not possible either. The author slows down the process of seeing by presenting the negative, because one can “earn” the positive image only by consolidating one’s capabilities of vision and the processes taking place in one’s consciousness. Jokeit disrupts the acquisition of an image by exposing the photographed objects to negative vision. He does it with the help of the “light brush” and by painting the world turned inside out, which will never be possible. He proves the idea of Roland Barthes – that photography is mortality – with his works. The idea of what will be arising in the image and dying before it could become the reality.